Strange Familiar is a pop band from Cuyahoga Falls and formed in 2006. They’ve become a bit of a television darling; their songs have been featured on popular shows like CW’s Vampire Diaries, ABC Family’s The Secret Life of the American Teenager, and mtvU. Their sound is a soft piano and guitar pop fusion with layered vocals. But unlike their previous work, Chasing Shadows falls short. It was a difficult album to engage in, something that I attribute to it comprising eleven agonizing slow songs with little lyrical creativity. Not a single song stood out as the feature. All of the work blended together and blended too well into the genre for it to be noticeable. Songs like “Run Away Heart” and “Shelter” have a 1998 Sarah McLachlan quality but the vocals are so layered and ethereal that they become distracting and dull. That alone may be the downfall of the album. There was no upswing or jam to it; a total lack of catchiness so nothing sticks after it has been consumed. This album would have a difficult time finding an adult audience because it has so little range. Some of the piano work helped break up the monotony but many of these tracks just lack innovation. Songs like “Being Me” and “Where I Belong” could be teenage angst anthems if they hadn’t been so flat. Every song topic has already been covered and made this album feel superfluous. “Being Me” tried to employ a bit of a R&B backbeat but it wasn’t enough to break the rigid mold. The trouble lies in the ornamentation of the vocals. All of the players in Strange Familiar are good independently but when they come together it fails to wow. Kira Leyden has a great voice but the Enya/Sarah McLachlan notes that are supposed to be “ethereal” and “haunting” are overused and strip Leyden’s voice of its originality or power. Lyrically the album is a mess. Songs like “Redemption” and “Alibi” explore no new territory, push no boundaries, dig no depths, and left me wondering who the target audience was. I’m a pop enthusiast, especially piano-pop, and yet Strange Familiar had me walk away from their album with nothing. The intimacy of the songs felt forced and lacked polish. 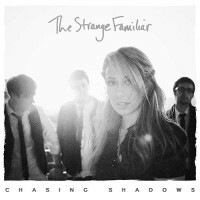 Chasing Shadows will fall short for Strange Familiar’s fans. It’s creatively disappointing and takes no risks. Track List: Run Away Heart, Falling Back to You, Being Me, Shelter, Unwanted, Echoes, Brace for Impact, It’s Easier to Walk Away, Redemption, Where I Belong, Alibi. Personnel: Kira Leyden (vocals, piano), Jeff Andrea (guitar), Frank Freeman (bass), Nicholas Sainato (drums). When I brought this album up in my ITunes player Lovedrug was classified as a “punk” band in the far column. As a fan of punk music this was exciting but after consuming Wild Blood from start to finish I don’t know that the all-knowing ITunes has this classification quite correct. Wild Blood is less of a punk album and more of a melodic throwback to early 2000s alternative. It shares more with Our Lady Peace than The Dead Kennedys. Wild Blood possesses the rarity of young sound with pure comfort. 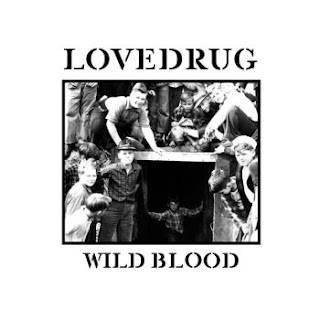 Lovedrug has been together since the early 2000s and is very comfortable with their sound. The title track is an anthemic tune that shares some commonalities with the later work of Hanson. The song has a positive team spirit vibe reassuring the listener that wild blood will set us all free. By the conclusion of the song I found myself a believer in this new revolution that called for the end of “hipster hell.” Unfortunately for Lovedrug they might find that a large percentage of their fanbase may be drinking the hipster Kool-Aid. The refrain is simple but that doesn’t take away from the solid structure of the song. The guitar work is classic and simple and the vocal tone blends with the surrounding instruments in a way that creates almost a choral quality. This vocal blending is found throughout the album and is both good and defeatist. In certain instances it might have been a better choice to turn up Michael Shepard’s microphone. On the track “Dinosaur,” which is probably the weakest song of the lot, the vocals bleed into the drums and a lot of the meaning is lost. The intention might to create a distance from the audience like a dinosaur would be but it might be a bit too literal for the delicate nature of the lyrical content. It was harder to decipher a meaning from the delivery than any of the other tracks. Most of the tracks contained simple guitar openings which are strong but a tad repetitive song after song. But some tracks stand out and on their own with luminescence. “Premonition” is a good love song, the sort of song that would find itself onto a mix for those who have newly fallen in teen love, and should probably be used for a heavy make out sequence in a film. It’s a versatile song that’s catchy without being sickly sweet brain candy--a pleasure to have stuck in your head like a new lover you keep running into on the street. “Pink Champagne,” besides being the name of a stripper, is a little limited lyrically but a solid jam tune. “Girl” is the first slow song on the album and felt the most out of place in the lineup. It’s the first slow song on the record, which showed restraint since most bands make their second song a dreary, strung out, solemn affair, but this one almost felt like filler. The guitar has a lovely lullaby quality and the harmonies are excellent but there’s a generic spa background loop that feels a bit like putting whale calls over “Angie.” The bridge is a nice break in the work but the ending line of chorus “you’re my girl” left this girl wanting more from her love song. Not to rag too hard but “Ladders” is a great division in the album and everything after it is more experimental and a little louder and messier. It’s a nice evolution and “Ladders” stands out with its freer guitarwork and possesses flavors of U2 and Coldplay without going overboard and becoming irritating. It’s a great song almost to the point that it would have made a better title track and focal point. “Your Country” employs political message and power. Considering it’s an election year it would make a good tune for entrance music. Someone call Sherrod Brown. The lyrics are uncomplicated but effective and a good grounding song in the overall work. Tracks: Wild Blood, Dinosaur, Premonition,Pink Champagne, Girl, Ladders, Great Divide, Your Country, We Were Owls, Revival. We are still just getting started, but there are some other folks out there who have been at the business of collecting and compiling news and reviews of Northeast Ohio music. Everybody has a different focus, and there's plenty of room for everybody. We wanted to tell you about them. This site has been around for several years, and keeps up on just about everything of note in the area (well, not much about Hiram, we noticed). They do some CD reviews, but the majority of their postings are previews and reviews of concerts, and interviews with artists. A page of links is very complete. Based in Canton, these folks keep you posted about all things related to the rock scene in that city, as well as Akron, Cleveland, and most other nearby burgs. There are lots of ads to give you the scoop. Coming out of Youngstown, they give you the straight stuff on music and other events in the Mahoning Valley. Check out what's going on east of Hiram. The Scene is the long-running free weekly magazine, and their website provides access to much of the content for those of us in the hinterlands. Music is just one of their things, so check out their investigative journalism, dining section, and other stuff. This is run by the The Northeast Ohio Folk & Traditional Music & Dance Society, a venerable organization. They publish a calendar of folk music concerts that you won't see listed anywhere else. Run by WKSU, this site covers local events, but its true focus is national, with news and reviews for folk and Americana music from everywhere. If you know of more great sites, please send the info to me, and I'll be glad to post the links. I'll be covering radio stations, record stores, recording studios, and artist's pages in future postings. Bobby Womack. The Bravest Man in the Universe. Debuting in June of this year, Bobby Womack’s The Bravest Man in the Universe is not only his newest album, but his first album of original work since 1996’s “Resurrection” and the cover art lets you know that this is no ordinary album. A hand with a twisted, broken-looking thumb resting on the top (yes, top, I said it looked broken) of the hand, and the fingernails are painted black and white. That visual is a great metaphor for the songs contained within- crossing boundaries, defying categorization, and beautiful in its strength after adversity. If you don’t know Womack, he was born in Cleveland in 1944 to African American Baptist parents, middle child in a sea of sons. Coming from that to the Rock and Roll Hall of Fame is just the beginning of his bravery. Womack’s dealt with the death of two children, a career over-shadowed by his wife’s dead husband, and drug addiction, and brings that experience to his tunes. The album is often grouped in “R&B,” but it definitely resides on the edgier side of that genre, with a feeling that harkens to Maxi Jazz and Faithless. Womack’s torn voice lays over crisp, clean beats for a striking juxtaposition that belies his personal strength. Womack has consistently been listed as an R&B artist, but he’s worked with musicians from Janis Joplin to Sam Cooke, Sly and the Family Stone to Aretha Franklin. This album shows that diversity well, while still staying mostly cohesive. While this is no doubt a solo album given Womack’s unifying voice through the multitude of sounds in this album, the guest appearances add variety and flavor, and the producers truly play the role of artist. It starts off with a gorgeously brief opening of Womack’s gravelly voice over The Demon Strings, stating the full title of the album, “The bravest man in the universe is the one who has forgiven first.” The Demon Strings performs in “The Bravest Man in the Universe,“ “If There Wasn’t Something There," and "Dayglo Reflection;" indiepop singer/songwriter Lana Del Rey performs on "Dayglo Reflection;" a number of other artists listed in under Personnel lend their voices to this piece of work that, like a piece of fine chocolate, takes time to appreciate, and only offers you the full experience if you wait and enjoy it a few times in different situations. From experience I can tell you that this is a great album to listen to with friends, a bottle of wine, and some quality food of your choice. Many of the tracks are R&B feeling, with some hip-hop overtones, especially in the use of samples in many of the songs, but the ending definitely has an upbeat feel the would make a smash dance track if sped up slightly. As it is, "Jubilee" is bouncy and fun with some “Max’s wild rumpus” sounds, but slightly too slow to do much heavy moving to. The practice of sampling in "Dayglo Reflection" is very interesting in that the sample is from Sam Cooke’s “Soul.” Knowing the history of Sam Cooke and Bobby Womack, and that history’s impact on Womack’s career, this sample is not just acoustically well-done, but meaningful in the concept of the album- strength, bravery, and forgiveness. Gil Scott-Heron’s introduction to "Stupid Introlude" is poignant and moving, and "Stupid" is an ironic piece of social commentary condemning the church, considering Womack’s status as a preacher’s son. Some have called this track one of the weaker tracks, and while that may be the case, it simply makes Stupid a diamond in the rough, instead of a perfect princess cut, while it is still stylistically solid. The gestalt of this album is a wonderfully telling representation of true bravery- being able to lead, have the “vision,” and execute it while still acknowledging the tremendous contributions of others. Personnel: Bobby Womack (Vocals and guitar), Richard Russell (Drum programming and effects), Steve Honest (Drum programming on If There Wasn’t Something There), Chris Storr (Trumpet on Love in Gonna Lift You Up), Jessie Ware (Backing vocals on Love is Gonna Lift You Up), Emma Muchando (Vocals on If There Wasn’t Something There), Lana Del Rey (Guest vocals), Gil Scott-Heron (Guest vocals), Fatoumata Diawara (Guest vocals), Richard Russell (Producer), and Damon Albarn (Producer). The Demon Strings Personnel- Izzi Dunn (Cello), Stella Page (Viola), Rory McFarlane (Double bass), Alice Pratley (Violin), Oli Langford (Violin), Nina Foster (Violin), and Antonia Pagulatos (Violin).